This was one of our first experiments we attempted in our STEM every day challenge. And it’s still a favourite of my kids. The kids love it because it’s just cool to watch a glowing ice cube melt! I love it because it is ridiculously easy to do yet it teaches so many different scientific things all at once. You get to observe 1) an ice cube floating, 2) freezing and melting, 3) cold water sinking, and 4) fluorescence (“glowing”) (Science Secrets Revealed). Oh and it’s completely safe! But let’s face it, the glowing ice cube is definitely the star of the show in this experiment. But why does it glow? It’s because we make the ice cubes with tonic water. 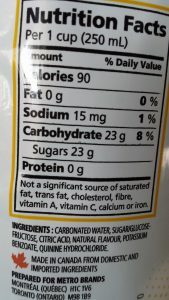 Have a peek at the ingredient list, you should see something called quinine listed. 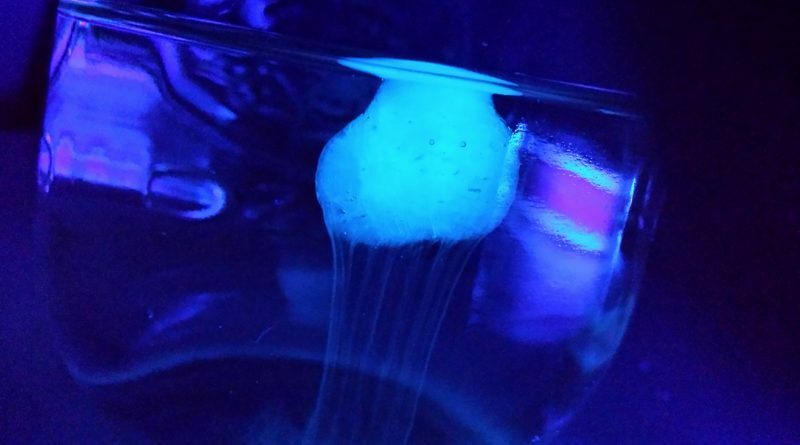 Quinine besides being fluorescent under a UV “black” light also has a cool history. Did you know that it was once used to treat malaria and restless leg syndrome? Although this practice is now discouraged. Today, it’s more about being a beverage or in our case an experiment! But what is this quinine? You can visit MolView to have a look at it. MolView is an open-source web application that allows you to view molecules online, and rotate them in 3D! Go ahead and play around with the different settings (look under the Model Menu). A perfect excuse for some screen time. They have quite the database, so you can search for other molecules too! MolView look at quinine Photo: Screenshot from MolView.org. We’ll come back to why this little molecule glows later when we explore the science behind these ice cubes. But now, let’s set this experiment up! Pour some tonic water into the ice cube tray labelled “Tonic Water” and let it freeze overnight. Pour some tap water into the ice cube tray labelled “Tap Water” and let it freeze overnight. 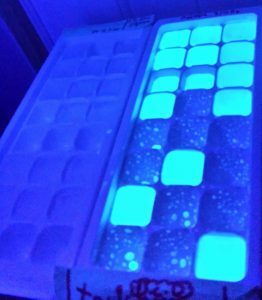 (Although this is an optional step, it is important to show the kids that regular ice cubes do not fluoresce and is unique to tonic water). Make sure all the ice cubes have solidified. 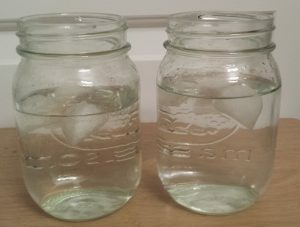 Pour some tap water (room temperature or colder) into both glass jars. 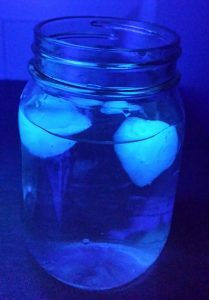 Take the jars with water, ice cubes, and black light to a dark room. Drop some tonic water ice cubes into one of the jars of water, and drop some tap water ice cubes into the other jar of water. Observe both under normal lightening. Observation #1: Ask the kids if the ice cubes are floating or sinking. Now turn off the lights and shine the black light on the jars. Observation #2: You should see the tonic water ice cubes glowing but the tap water ones are not. Shine the black light on the ice cubes still left in the trays. Only the tonic water ice cubes will be glowing. Watch the cubes melt as long as you like. Because it’s just fun! 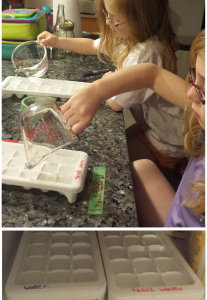 Have the kids set up the ice cube trays the day before. If you are attempting the STEM Play Every Day challenge, it’s a great way to spread the science out over more than one day. Doing this also teaches the importance of preparation. Not all experiments are instantaneous. They take planning and preparation before the execution. Also, teach the kids to label everything. Without a black light you would not be able to tell the tap water from the tonic water, just by looking. No taste-testing! And although this experiment is technically edible, when in “home laboratory” mode, I teach that we do not ingest anything. This is an important lesson for when we do handle potentially poisonous substances in future experiments. Are you looking for a black light? We got ours at the pet store! They sell them to help find pet accidents. Many bodily fluids are actually fluorescent. That’s so gross! You can also buy black light bulbs at the hardware store. We did the reverse experiment where we put tap water ice cubes into tonic water. Unfortunately, the fluorescence from the tonic water was so strong that we couldn’t see the ice cubes at all. So not worth your time. Wow! There are so many things going on in this simple experiment. First let’s talk about the ice cube. When we put the liquid water into the freezer we ended up with ice. This is the same as saying the water went from being a liquid to a solid in a process called freezing. 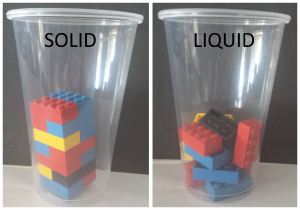 Solids, liquids (and gases) are different states of matter. We can reverse the process and go from a solid to a liquid by applying energy, like heat, and we call this melting. This is what our ice cube was doing, going from a solid to a liquid because we added heat (heat from the water in the jar, heat from the air). If you had a super strong magnifying glass and could look into the ice cube you would see all the little water molecules perfectly lined up. All the water molecules inside our ice cube are very organized, all standing in perfect rows and lines. The ice cube is in a solid state. But when the state changes to a liquid, the molecules have some more freedom and are no longer all perfectly aligned and are hanging out more randomly but will still be confined by its container. Before we can answer the questions “why does an ice cube float?” and “why does cold water sink?” we need to learn about density. Density is defined as mass per unit volume. Basically, it’s how much “stuff” is packed into a defined space. Let’s imagine we have 2 empty classrooms of the exact same size. In classroom #1, we add 5 students to the room; in classroom #2, we add 100 students. Which classroom is more densely packed? The answer is classroom #2! The students are likely packed in very tightly with not much space to move around compared to classroom #1. Now back to our ice cube. When it starts to melt, the newly melted liquid water will likely be colder than the surrounding water. Cooler molecules move very slowly. Imagine you have a bunch of super slow swimmers (our cooler molecules) and you tell them to try and swim away from each other but as slow as possible. They will end up staying pretty close to each other. They will be packed together, making the group of swimmers (cooler molecules) MORE dense! That means the cooler water because it is more dense will sink (which is what you see in this experiment). The warmer molecules (our faster swimmers) can get away from each other more easily allowing them to spread out. Less compact means less dense. We saw the ice cube floating in the jar of water. So would you guess that ice cube is more or less dense than the liquid water? You’re right, it’s less dense! When water freezes it turns into ice, and all the molecules arrange themselves in such a way to take up MORE space (compared to how they were in the liquid water). Taking up more space makes it less dense! (Fewer molecules per volume). Because the ice cube is less dense compared to the liquid water, it floats on top. Why does tonic water glow? I already gave away part of the answer; it’s quinine! But why? Some molecules can absorb energy, when this happens they become excited. Think of a kid who has eaten way too much candy and is on a huge sugar rush and running around the house like crazy! Thankfully, those kids will eventually return to ‘normal’ after the sugar starts to wear off. So do excited molecules, they want to return to normal, to their low energy (“relaxed”) state. Now our kids probably got rid of some of their ‘extra’ sugar energy by releasing it in the form of high energy play. Molecules also need lose this extra energy. 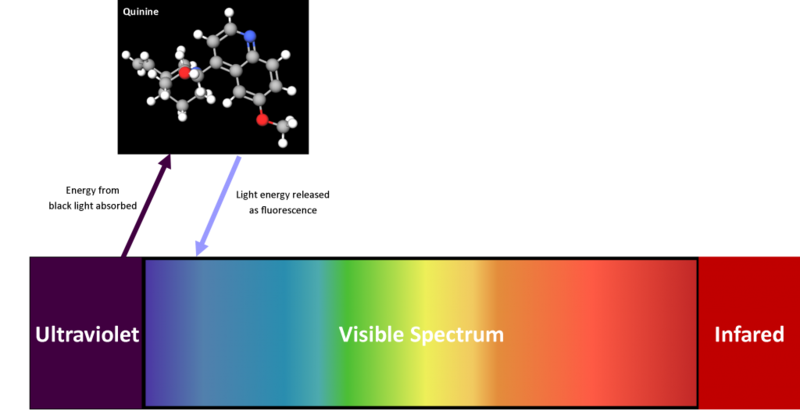 Fluorescent molecules release this energy in the form of light (which is actually a form of energy!). 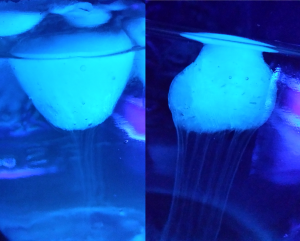 And we call this process fluorescence. We are using a black light in this experiment. A black light gives off light in the ultraviolet range, which because it’s not in the visible spectrum, technically we can’t see it (this is why we call it a black light). Although you will see a purple glow coming from the black light because its wavelength is SO close to the purple part of the visible spectrum. Now in our experiment, the quinine molecules “ate” up the energy from the black light, which then got them all excited! When the quinine released this ‘extra’ energy’ we saw it produce a glow. Did you notice the colour coming from the black light and the ice cubes are different? That’s because the energy that went into the quinine molecules and what came out are slightly different. The quinine molecules “lost” some of the original energy doing molecule things. And that folks is why the ice cubes glow! Phew that was a whole lot of science. Tonic water anyone?